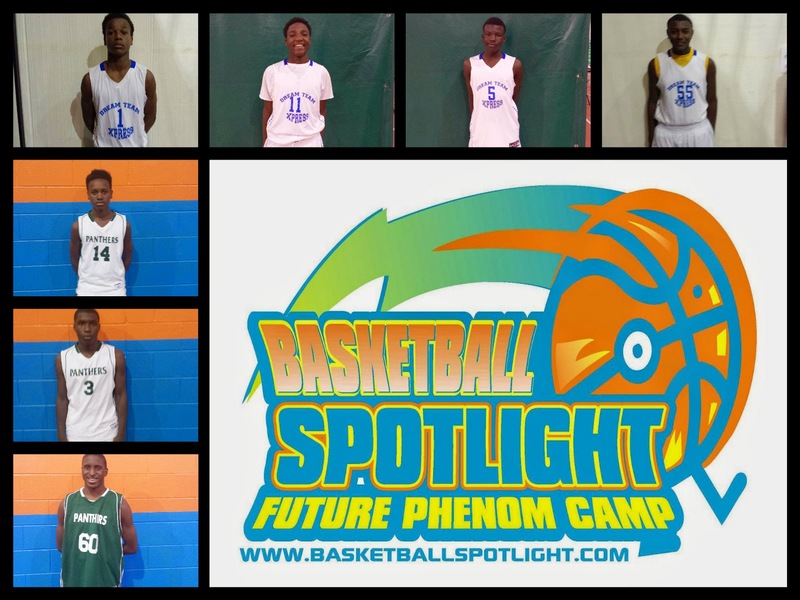 BASKETBALL SPOTLIGHT NEWS: Basketball Spotlight Feature: Virginia and Georgia Players Line Up For Future Phenom Camp! Basketball Spotlight Feature: Virginia and Georgia Players Line Up For Future Phenom Camp! The Basketball Spotlight Future Phenom Camp continues to grow as big time commitments have come from the Virginia and Georgia areas. They players are new to the Spotlight scene and are eager to show they can handle the best. Here are the group of players that are ready to tangle on August 23rd and 24th in District Heights, MD. LeonTre Bauley – Class of 2019: Just look at the picture – your first thought is that this is a grown man; your second may be what he is doing on Bball Spotlight. We THOUGHT you should know that Bauley is a 7th grader, age 14 and he wears a size 17 shoe. One of the most imposing physical specimens in the class of 2019 at 6’7 he can play all 3 front court positions. His favorite player is Lebron James and he wants to be able to play any position and from what we have seen this may be in his cards prior to entering high school. Besides being a complete scorer Bauley shows great court vision and works the pass well off the dribble and the catch. We are looking at a future 6’10+ multi-dimensional combo forward; who can handle, score, shoot, and defend already. What’s unreal about this player is that he has only been playing for 2 years and is still learning the nuances of game; yet having high level success. Bauley doesn’t even know how good he is and is actually focused on becoming an engineer and not a NBA player. Once you see him play on August 23rd and 24th you will HOPE Bauley never picks up a ball again as he undoubtedly is a star of the future. Alvonte Lawton – Class of 2019: Built like a cannon ball Lawton is powerful and likens to a in stature and style of play to Ty Lawson ironically. Not as quick and at the same juncture maybe just as good a scorer; but not penetrator. Lawton gets the job done; with a very deep group of point guards attending the Phenom Camp on August 23rd and 24th Lawton is not a household name, but he has all the tools to challenge and if taken lightly he will light it up. He dropped team/game high 28-points from the lead guard position in Memphis a few weeks ago while contributing on the boards as well as running the team. Tough and with a solid motor he is a relentless penetrator that likes contact and challenges his defender and bigs with the “big chip on his shoulder” that he wants someone to try and knockoff. Jamari Smith - Class of 2020: Already standing 6’0 Smith is extremely athletic and likes to initiate contact when attacking. A certified scoring one Smith consistently puts up 20+ ppg in games vs elite competition and against lesser talent has been known to drop in 30 to 40 on occasion – just last week in the 6th grade nationals Smith punished opponents with a 41-point effort leading his squad to a 74-61 victory in bracket play. Excellent 3-point shooter Smith is at his best in the transition game where he will does what may be is strongest attribute; dribble penetration to the hole. Going to the basket it’s tough to stop Jamari as his frame, length, and physical nature are advanced for this level. Coming from a small market Smith has not received the recognition that he would if he played in a major basketball city. That all ends August 23rd & 24th and Jamari come to the Spotlight to claim what he believes is his birthright; a spot as one of the top players in the country. Antwon Barnett – Class of 2020: From Montgomery, Alabama they feed and grow them a little different down there. Long arms and legs Barnett covers a lot of space very quickly on the floor and is a big-time defensive stopper as well as a help side defender. He knows how to use the tools that he has and as member of the 2020 class standing 6’2 he can guard 4 and against some teams all 5 positions. A solid perimeter shooter out to 18-feet he knows his game and maximizes it well. Versatile enough to handle the ball vs pressure his attack game is played well above the rim already. This is the type of player you typically don’t hear about until High School as his skill projections will make him a prototypical combo forward with ball skills; this is the beauty of his attendance at the Phenom Camp as defined by its name on August 23rd & 24th America will see the future. Tyjavious Bedgood – Class of 2020: Country strong and gigantic at age 12; the nephew of former NBA All-Star and Champion Ben Wallace has a mom who stands over 6’4 and he is already 6’6 with a big body and weight barring frame. So long and thick he physically beats you up every possession; and he enjoys it. He projects to reach 6’9 -6’11, so 7’ isn’t out of the question and his growth pattern does nothing to make you doubt as he still has two more years of Middle School ball. Right now like his Uncle he dominates both glasses as a rebounder, and blocks shots like it’s his hobby. He fills lanes and runs the floor like a gazelle; the only thing that is missing is a sophisticated post game – right now the Shaq like power game will be unstoppable by most; once its developed they may not be an answer. If you do not like physical basketball and tough post play; the Spotlight Camp on August 23rd & 24th may not be the right place for you because Bedgood knows no other way to play. Keonte White – Class of 2020: The ultimate rim protector; a quick leaper with an equally fast second jump White blocks shots at an extremely high rate. It is unfair when the 6’4 forward is used defensively on the perimeter; White guards everyone and anywhere on the court can guard in space up to 94-feet. Keonte is raw offensively but has next level tools and a high motor and passion for the game. Another player at this young age with tremendous tools; these are the kids that become stars at the next level all the time. His passion and love also say so as he dreams of attending Syracuse; how ironic giving his physical attributes – he already looks and plays like a young Jerami Grant and we mean middle school Grant not Syracuse Grant. Put him on the list; 6’4, 12-years old, physical specimen…scary – and yes, he will be at Spotlight Camp waiting for anyone and everyone. Keandre Lambert – Class of 2020: One of the top players in the Va. Beach area; Lambert is a knockdown shooter who specializes in the 3-point shot. Lambert has had some very impressive scoring outburst, and with his length he is able to score and shoot over opponents. His tools allow him to be a factor on both ends and he combines these tools to be a scorer and not just a jumper shooter. His 7 3’s in a game exemplify his skillset as a wing guard; the movement to the 2-guard would further increase his value and as he develop this will be his likely position.